Deck the halls with revealing banners, fa la la la la, la la la la. 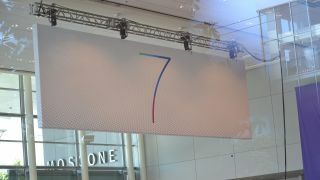 That may be the jingle bouncing through Apple's head today as the company is prepping San Francisco's Moscone Center - home to next week's WWDC 2013 - with banners displaying the number "7" and a big ol' "X." MacStories snapped the first pics, and we boogied downtown to grab our own soon after. While not hard and fast confirmation that we'll see an iOS 7 and OS X 10.9 preview come forth during the company's opening keynote Monday, this is pretty much as close as it gets. The company has stated developers and folks at home can expect "an in depth look at what's next in iOS and OS X" during the conference. iOS 7 is said to be a marked departure in design from previous iterations, thanks to the anti-skeumorphic touch of Sir Jony Ive. If you're into reading really closely into things, the solo, elegantly swished 7 and meshed background on the WWDC banner could provide hints to what we're in for Monday. Just like Apple's banners, our news nugget blips cut straight to the point.